マイクロナノバブルシリーズ | Tanaka Metal Factory CO., LTD.
What is a micro nano-bubble? The ultra-fine micro nano-bubbles are small enough to get into skin pores and wrinkles to absorb and clean any oil, dirt and sweat. The skin moisture and skin surface temperature also increases after bathing. The micro nano-bubble power gives us beautiful skin and glossy hair. Nice effects we can feel. High moisturizing keeps skin hydrated. Cleaning excess scalp oils restore the scalps natural balance and boosts hair volume. 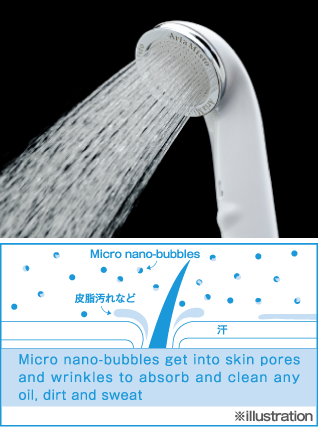 Super tiny air bubbles create a gentle shower feeling. Skin surface temperature increases making it less likely to feel cold after bathing. Micro nano-bubbles absorb and wash away dirt, eliminating pet odor and keeping the coat of hair glossy. The part sending water from the hose to the shower head is narrow which will reduce the amount of water used. In other words, not only is the water bill reduced, but the cost of heating the water will also decrease. In the case of a family of four each taking a seven minute shower every day. By saving 50% of a 14L/min water flow, yearly water saving of 27,000, 2 liter pet bottles can be made. 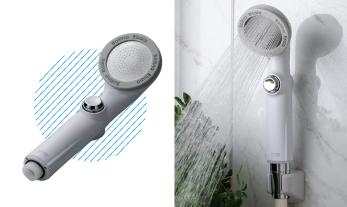 It was the release of the Ariamisto shower head, using the micro nano-buble generator μ-Jet device, that Tanaka Metal Mill was launched to the world. The Bollina Ninfa is the new upgraded model released in July, 2015. Retaining the warm bath effect and increasing the moisturizing effect the Ninfa has a beautiful sleek design that is different from previous designs. Above all, the highly praised functions and luxurious silver quality is suitable for showers in luxury hotel rooms. The Risaia has a one touch water stop button that increases its water saving function. 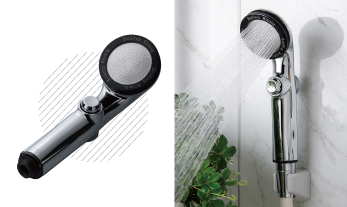 Our unique technology incorporates the button in the housing of the shower head giving it a superior sense of quality. The stylish silver color is in demand with major hotel chains and in the beauty industry. It is also gaining popularity as a gift at weddings or house warming celebrations. 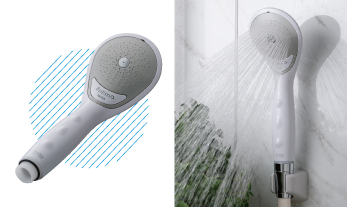 ※The one stop function of the Risaia is designed to leak a small amount of water to protect the shower head. See here for more details. The top selling shower head for internet sales. 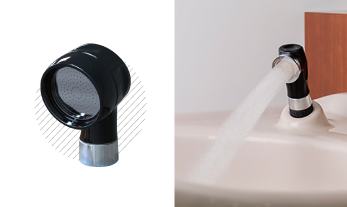 Called “the miracle shower head”, the Ariamistso is the core product of Tanaka Metal Factory and is used and loved by customers all throughout Japan. The Micro nano-bubbles will always be generated as the cartridge doesn’t need replacing. This is kind to the environment and economical. The Ariamisto Bollina SIDE PRO was developed especially for beauty salons. The light turn function makes it easy to use while washing out shampoo. It will achieve about 30% water saving compared to normal shower heads. 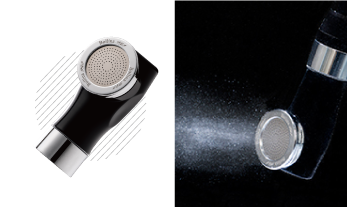 The Bollina PET CARE shower head uses patented μ-Jet technology which generates tiny micro nano-bubbles. These bubbles penetrate into the hair follicles to clean out dirt and oils. This removes any odors and leaves the coat feeling glossy and shiny. 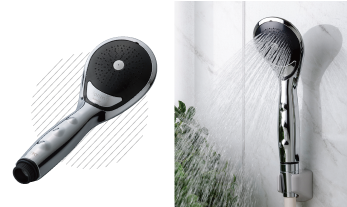 The shower head can be rotated easily and is compact enough to hold in one hand leaving the other hand to handle the pet. 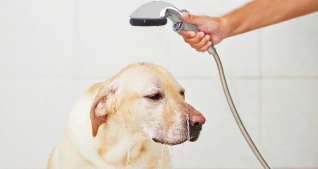 It can be used to wash any animals including dogs, cats, rabbits and even ferrets! The Bollina PET CARE can be attached to the indoor shower hose and also comes with a one click attachment that can used to connect to an outdoor hose.